This small, nonpoisonous snake is Minnesota's only green snake. It is also known as a grass snake. This snake's most obvious defining trait is its bright green color. A few individuals are light brown instead of green. True to its name, it has smooth scales. The smooth green snake is about 1 to 2 feet long. The color is green with a yellow or off-white underside. Smooth green snakes mate in the spring. The female lays 3 to 11 eggs. How long the female waits to lay her eggs varies, however. Sometimes the eggs actually hatch before they are laid. The young are about 4 inches long. 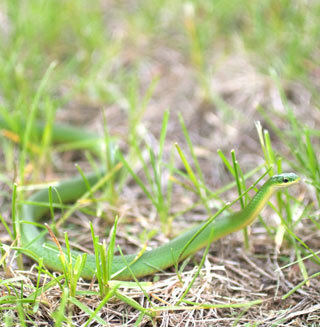 Smooth green snakes eat mostly insect and spiders.